Drone headless mode is a new technique in flying drones – which essentially makes it easier, particularly for novice flyers to control their drone. 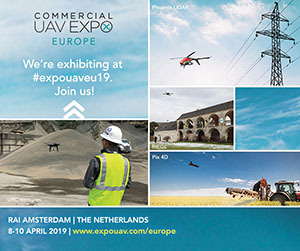 Drone headless mode has become a common feature not only in the more expensive drones but more particularly also in standard and beginner and training drones – this is because entry-level drones are the ones which most require headless mode. Further below, we will explain the reasons why headless mode is actually required in entry-level or budget drones. And why it is NOT cheating! At DronesBuy.net, we’ve got a passion for drones. Visit our website often to get all the latest and greatest news, reviews and information content about these tiny flying gadgets! 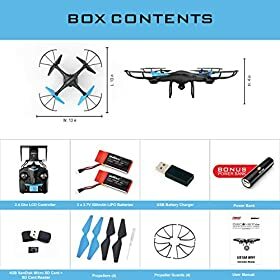 Should I buy a Headless Mode Quadcopter? 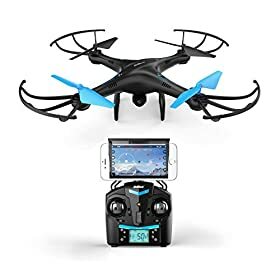 What is a great headless mode drone I can buy? A quadcopter, also known by names of a drone, a multirotor, or a quadrotor, quadrocopter, UAV (unmanned aerial vehicle) is a manageable mechanical flying machine that usually has four arms thus the name quad. It has a motor, which attaches to a propeller in each arm. Quad arms, helicopter-like propellers, and hence the name quad-copter, or quadcopter. To be able to maintain lift and fly in any direction, in quadcopters, two rotors rotate clockwise, the other two rotors rotate anticlockwise. A quadcopter has four controllers whose function is to send commands to the drone in the yaw, throttle, pitch, and roll. Before we continue, a quick diagram of what each of the above are visually. The controller also helps to make minor corrections to the drone by the use of the four trim buttons in it. For hovering in the same place, the upward lift force must balance the downward force of gravity. To fly higher, you need to increase the lift effect more than gravity – this is done by increasing the RPM on the four propellers at the same time to produce more lift force. To land the drone or decrease its altitude, you need to push the left stick down, which in turn reduces the rotor RPM. This decreases the lift until gravity is higher than lift and hence brings your quadcopter down. To move in the direction of your choice, you need to change the lifting force angle for it to have a horizontal or vertical component. To move it forward, adjust the right pitch of the controller hence the front propellers decrease RPMs, and the back propellers increase RPMs producing a horizontal component thus moving the drone forwards. To go backwards, you need to increase RPMs of the front propeller and reduce the back propellers RPM. To move the quadcopter to the left, you need to apply a lift force to the left of your propellers which decreases the RPM on the left rotors and increase the RPM on the right side hence moves the drone to the left. The opposite will take the drone to the right. As we can see, operating and flying a drone, like discussed above, is complex and laborious for a beginner and hence the increasing use of headless mode drones. So, exactly what does headless mode mean and why is it necessary? We have all the answers right here. Read on. Have a look at the drone below. Can you easily identify which is the front and which is the back of the drone? Imagine you’re actually flying this drone outside, against a blue sky, with the drone being 50 meters away (which is less than the maximum range of this drone). 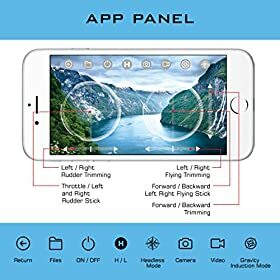 For a beginner, (and for anyone really) it is hard to identify directions in quadcopters because of their symmetrical nature and hence some basic knowledge is required to be able to recognize the front and the rear side. Recently, as this started to become a problem, some manufacturers actually added red LED lights to the front of a quadcopter, while the backside got dark LED lights colors. Although this helped, the further you fly your drone, the smaller it looks and thus knowing the directions is still tricky. That’s when it was decided that the best way forward was to implement drone headless mode. If you’re just learning how to fly a drone, flying and controlling a drone is already taxing – why would you also need to figure out which direction you have to fly your drone? Imagine, a drone without headless mode. You attempt to fly it forward and it actually flies back toward you. Headless mode is essential for beginner and drone pilots who are still in training. Imagine your kid learning to fly a drone, why would you want to confuse them further? But why do we believe this is not cheating? Is ABS (Anti-skid Braking System) in cars cheating? No, it’s making them safer. What about ESC (Electronic Stability control)? Is that cheating? No, it is also making cars safer to drive. Systems which help and guide pilots are not cheating … they are a means of making a complex system, simpler and safer to use. Should you always use headless mode? Or make sure it is present in every drone? Not necessarily, you’ll find that eventually, once you master the techniques of flying a drone, you’re going to find that headless mode is not going to be necessary. But rather than cheating, headless mode and other automations such as drone one key return make it simpler to learn how to fly a drone. When you activate the headless mode, the onboard flight computer aligns the drone movements to be corresponding to the user. In essence, in headless mode, you don’t need to worry about the direction the drone is facing. In reality, headless means just that, the drones does not have a head or a tail. Any side of the drone can actually be the “head” – hence why it is headless. I’d dare say, this mode should have been called tailless because all sides are actually the head, but I’ll digress. In headless mode – the drones front direction is aligned to the drone controller. Whichever direction you yaw it, the drone moves comparable to your direction, or the direction of the drone controller. What is drone yaw in headless mode drones? Headless mode drones help you to avoid losing control of the direction of the quadcopter. Even if the drone is pointing towards you, with headless mode activated, the drone will not hit you but moves away from you. If you’re more into a live explainer of what quadcopter headless mode is and how it works on an actual drone, you can have a look at the brief video. For inexpensive drones, it is important to enable the headless mode before taking off. Set the quadcopter in front of you and (what will be) the front side of your drone corresponding to your front side. Activate headless mode and then push the throttle to fly the drone. 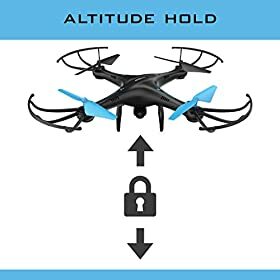 With the quadcopter in headless mode, when you pull the left rudder, your drone will turn left, and thus it becomes easy to operate the drone even when you can no longer see the front or rear side of it. This is especially true when the drone is flying relatively far away from you. Most expensive and of course advanced drones use a digital compass that does not need activation before taking flight. 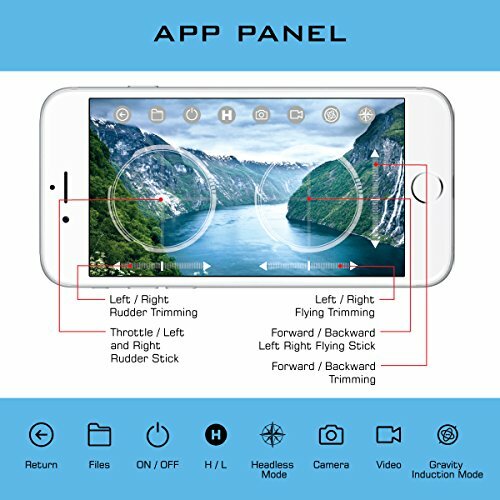 The digital compass helps you adjust and change the drone’s orientation dynamically without any stress. Most pilots who are used to the regular flying setup still find no need for using a headless mode drone since basically, headless mode drones are manufactured to act as toys and thus ideal for less-serious tasks. For a beginner, however, using a traditional drone might sound like a nightmare. For kids and even adults who use drones for fun, buying a headless mode quadcopter is the best decision they can make. Headless mode minimises the chances of a drone crashing thus less damage. It is advisable, however, to buy a cheaper model of a quadcopter since upgrading is another hectic issue. Most headless mode drones work on magnetometer principle and thus if you fly metallic or near metallic objects, the drone may malfunction or even throw off your magnetometer. It will be surprising for a drone to stop working and you cannot bring it back. 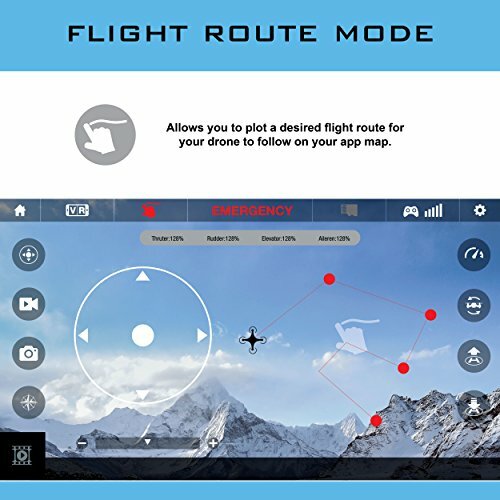 It is, however, advisable to learn using a drone in the traditional mode also, so that after trying out the headless mode and thus you will be able to switch between the two modes if need be. One of the best drones to learn how to control a drone is definitely the UDI U45, which supports headless mode. 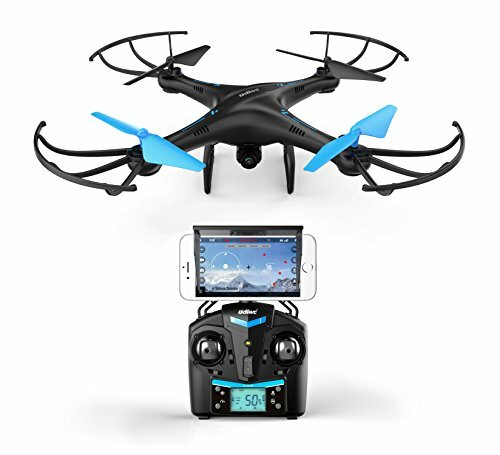 The Force1 U45W Blue Jay – the #1 best selling drone on Amazon which supports headless mode. 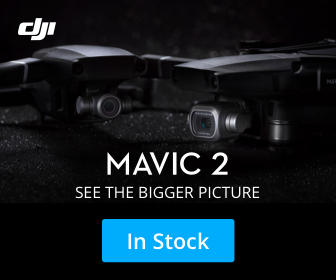 Once you’ve learned to fly and control the U45W, you’ll will then be able to pick up a more expensive drone, or one with more complex features and specifications, such that you can take your quadcopter / drone hobby to the next level! Click on the below to find the best deal to get the U45W from Amazon. ONE TOUCH TAKE OFF AND LANDING: Drone automatically hovers at a set altitude after take off and before landing making it easy to control and maneuver, especially for beginners who are not yet skilled. Ready to start flying your drone? Now that you’ve learned to fly a drone in headless mode, are you ready to take your drone flying forward? We’d love to hear your comments about this article. Leave a comment below. And if you this article, please share it with your favourite drone groups on Facebook! The DJI Spark new Mini drone is here – all you need to know! I have never owned or flown a multi rotor drone. I am thinking about trying it out and I am researching them trying to learn all that I can.